With increased attention to energy conservation, fiberglass insulation has become popular and recognized as one of the most significant solutions in creating a more energy efficient home. If you need a fiberglass insulation company in Virginia Beach or surrounding areas, you can count on the team at Tidewater Insulators. We work with homeowners to install fiberglass insulation in homes and commercial buildings, for both retrofit and new construction projects. Looking for a reputable insulation company in Southeastern Virginia? Call 757-828-0024 or contact us online to speak with our experts and get started today! 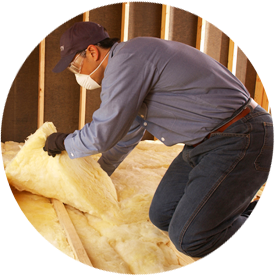 At Tidewater Insulators, we install fiberglass batts insulation in walls, ceilings and floors in homes in Richmond and throughout the Norfolk, Virginia Beach and Newport News, VA areas. Batt insulation comes in pre-cut panels and is typically made of fiberglass. It’s one of the most common forms of insulation available. Batts can be installed in various areas, such as the attic and walls. Contact our insulation contractors today to schedule a FREE consultation for your fiberglass blanket insulation! Often referred to as blown-in insulation – based on its method of installation – loose-fill fiberglass insulation is a collection of loose fibers or nodules that are blown into the wall cavity or attic. Loose-fill fiberglass insulation requires specific industry designed equipment that agitates, expands and distributes the fiberglass to its desired depth. Loose-fill fiberglass insulation is recognized for its continuous coverage, flexibility and ability to fit into tight or low crevices. Contact our insulation contractors to schedule a FREE, no-obligation consultation today, so you can see where installing insulation can benefit you and your family the most!